Masdevallias, of which there are around 400 different species, belong to the Pleurothallidinae family. This large group of plants is found in central and south America, particularly in Colombia, Peru, Bolivia and Ecuador. Masdevallia veitchiana and Masdevallia coccinea are two excellent examples, having lovely foliage and large, almost fluorescent blooms. Although masdevallias are found in the tropics, they grow at quite high altitudes and therefore need to be grown under cool to cold conditions in a protected shadehouse or unheated glasshouse. Masdevallia veitchiana, found chiefly in Peru, is an excellent plant for beginners and experienced growers alike. It grows quickly into a specimen plant and is quite spectacular when several flowers bloom together usually between spring and summer. M. veitchiana prefers a cool, moist location but, like most orchids, requires good light to flower consistently. In poor light the flower stems tend to be weak, causing the flowers to droop. Summer time can trouble masdevallias, because they prefer shade and lower temperatures rather than strong sunlight and extreme heat. 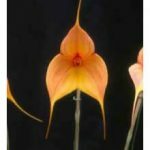 Keep Masdevallia veitchiana in a cool and well-shaded spot during our hottest days and you will be rewarded with a fine looking plant and beautiful orange flowers on tall stems. Masdevallia coccinea is a lovely Colombian species which grows at an altitude of 2500-3000 m. It is an attractive plant with glossy green leaves and has large flowers in shades of pink, purple, cerise, yellow or white. An excellent variety is Masdevallia coccinea var. Harryana, which has tall flower stems and well shaped, almost fluorescent flowers. Masdevallia coccinea and M. veichiana have similar cultural requirements. Another attractive species is Masdevallia anguiata, which produces pendulous, pink/purple-spotted flowers. A cool grower, it requires good air movement and humidity, plus slightly stronger light to flower at its best. M. barlaeana is another interesting species with growth that tends to creep along the top of the mix. It produces bright red flowers on an upright stem and soon forms an attractive specimen plant. M. barlaeana ‘Harold’ is often available, but some growers find it reluctant to flower. Masdevallia tovarensisis an eye-catching, white-flowering plant from Venezuela, its flower stems producing multiple blooms. The old flower stems should be left on the plant as they usually produceflowers several times over a period of three to four years. 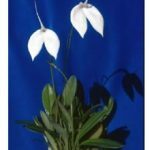 Other masdevallia species that can be grown in Melbourne include M. bicolor, M. uniflora, M. infracta, M. amabilis, M. ignea, M. triangularis and M floribunda. Hybrids. There are now over 400 registered hybrids and some of these produced since 1980 are spectacular. 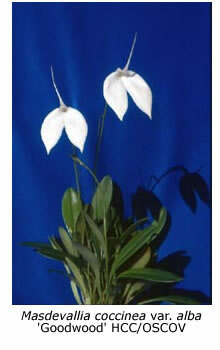 Masdevallia veitchiana is a parent of many hybrids and tends to pass on its good characteristics to its offspring. M. veitchiana x M. angulata produces M. Prince Charming; M. veitchiana x M. floribunda gives M. Sugar Baby and M. veichiana x M. infracta gives M. Marguerite. More recently we have seen second and third-generation hybrids. Some to look for include M. Harlequin, M. Mary Staal, M. SunnyAngel, M. Angel Blush, M. Angel Glow, M. Peppermint Glow, M. Angel Blush, M. Carousel, M. Joy Edstrom and M. Kimballiana. Repotting Masdevallias. 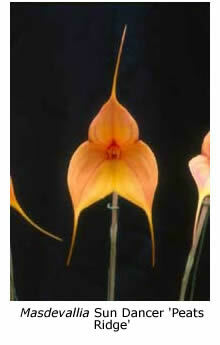 Generally, masdevallias like to grow into large clumps and they should not be broken up too frequently. When repotting, use larger-sized divisions and re-pot into relatively small pots when the plant is in active growth. Composts can vary from live Sphagnum moss to bark-based mixes. The main requirements are excellent drainage and a mixture which retains some moisture without becoming soggy.